This explosion was close -- much closer than the others that had rattled the village on the outskirts of Homs, Syria, where Sultanah Alchehade lived with her four young children. This one hit the school next door, blasting out one of the walls of their house. Alchehade grabbed the children and ran into the night and the choking smoke and dust. A neighbor helped her carry her three-year-old twin boys, Mounzer and Kaiss; another drove the pickup truck they all clambered into. Over the next several days, as bombs continued to fall, the family -- including daughters Kawthar, age six, and Roukia, a baby -- took refuge in a nearby forest, sleeping under the trees as Sultanah tried to figure out their next move. 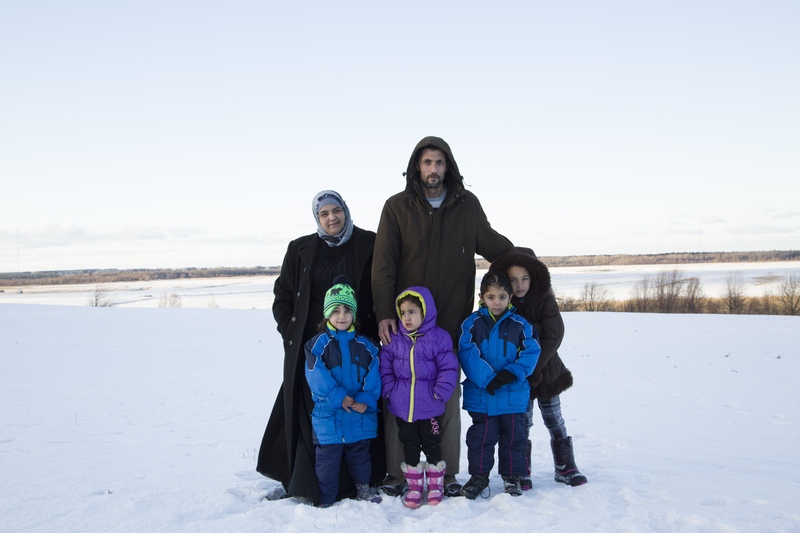 Mazen and Sultanah Alchehade are building a new life for their children in Nova Scotia after being forced to flee their home during Syria's violent civil war. More than 11 million people have been displaced since the conflict began in 2011. In neighboring Lebanon, Sultanah's husband, Mazen, frantically tried to contact his wife. For years, Mazen had shuttled back and forth across the border every few weeks to do construction work on high-rise buildings in Beirut. While the jobs provided an income for his family, he says, the separation was hard. But their situation had just gotten much harder. With the Syrian civil war now engulfing his village, Mazen couldn't return. And it would be four months before his wife and children could cross into Lebanon. Eventually, the family was reunited. They were alive. But they were refugees, seeking asylum in any country that would take them, hoping to get far away from the violence that had driven them, along with millions of other Syrians, into foreign lands. 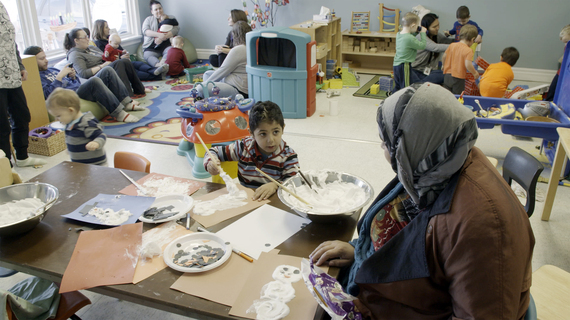 Meanwhile, 8,000 kilometers away, Rotary members in the small town of Amherst, Nova Scotia, were watching images of Syrian refugees on television and looking for ways to help. In September 2015, members of the Rotary Club of Amherst were thinking about their next international project. Over the years, the group has helped build and equip a school in South Africa, provided educational materials to students in the Bahamas, and raised funds for disaster-stricken areas around the world, but their thoughts turned to Syria as the plight of refugees dominated the news. "We as Rotarians couldn't ignore what we were watching each and every day," says club member Ron Wilson. "Families dying while making their journey to Europe or other places. Families desperately trying to flee war and, sadly, their homes. The heart-wrenching images were the impetus for our club to do something." The Rotary club began by gauging the community's interest in the project. They learned that two local churches, First Baptist and Holy Family, were also looking for ways to support refugees. There was a logistical benefit to working with the churches: Both are sponsorship agreement holders, meaning they signed an agreement with the government to bring refugee families into the country -- something that would take the Amherst club two years to obtain. In return, the club handled administrative tasks, communicated with the Canadian government, and led fundraising efforts. It also donated $5,000 in seed money to get the project off the ground. With the community firmly behind them, the club welcomed the Alchelades family into Amherst. Their long journey to a new home had ended. Their journey into a new life was just beginning. While many Syrian refugees prefer to settle in Toronto or Montreal where there are more resources and jobs, the Alchehades wanted a smaller community, like the one where they had lived in Syria. There, they had land where they grew almonds and olives, and raised cows, goats, and sheep. The family arrived in Amherst with what they could carry. Most of the furnishings in their new home, a two-bedroom apartment in a modest house on a street that dead-ends at the marshes, are donated. The four children are energetic and open with one another and the Rotary members who visit. They love playing in the snow and singing the alphabet song, which they quickly learned from English tutors who regularly visit their home. They sing it while watching TV, while playing outside, when guests come over. The Rotary club helped connect Mazen with a job at Fundy Landscaping, which does stonework and builds retaining walls and decks. There, he is using the skills he learned doing construction in Lebanon. "He does great work," says business owner Peter Michels. "I don't need to tell him anything twice. Everything we ask him to do, he runs with it. His skills and work ethic are very impressive." Michels, whose parents immigrated to Canada after World War II, says he sees a little of himself in Mazen and his family. "Everything you had is completely gone," he says. "Trying to start a new life in a place where you don't know if you're going to be accepted or if you're going to be rejected. I try to see things through his eyes. That's probably what my family went through -- hoping that when they came to this country, there would be somebody to help them." The town has rallied behind the refugee family, with teachers volunteering to tutor the kids and dentists offering free care. Mazen has earned his driver's license, and Sultanah has joined other mothers in the community for cooking classes, even leading a class on preparing Syrian dishes. Each week, Sultanah and her three youngest children visit Maggie's Place, a family resource center in town that provides social and educational programs to parents and their kids. The kids are learning to ice skate, Canada's national pastime. These are small steps in the long process of integration that the club hopes will help them find their place in Canadian society. "We want them to be able to help improve this community and the country," says Wilson. The Alchehades don't know if they will ever return to Syria. But right now, Canada is their home. This is where they want to see their children grow up. While Mazen still struggles with English, he has no trouble finding the words to describe his dream for his children: "I want them to be pioneers." A version of this article originally appeared on Rotary.org.